We all know that pirates and flintlocks go together like sharks and teeth. We equally know that some pirates would fly the Jolly Roger flag, featuring a skull and crossbones to let victim ships know that they would give no quarter. Well, Feast your eyes (and hands) on the perfect combination of those two pirate staples. 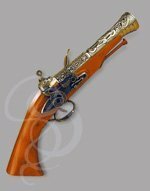 This replica pirate flintlock reproduction is similar to ones found in the 17th and 18th centuries. 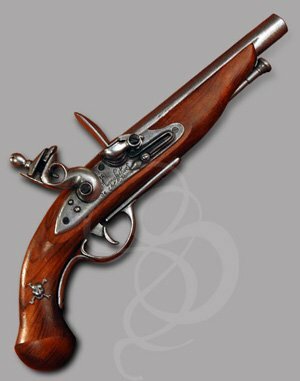 It is a slim, efficient flintlock (though non-firing), with fully working locks and trigger. A simulated redwood stock has the perfect combination of grain and grittiness. 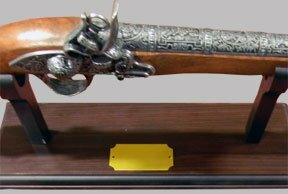 Engraved steel lock plates on the front and back tell a little about the history of this flintlock. The words "Manufactures Se Snt. Etienne" reveal that the original flintlock was built in France, at the St. Etienne Aresenal. This manufacturer was a very popular flintlock maker in the late 17th century and early 18th century. It continued to make flintlocks long into the 20th century, designing several guns that were used in World War I. On the rear side of the pistol are the numbers "206." Here ate Strongblade, we pride ourselves on always telling the truth, so here we go: WE have no idea what those numbers mean. If anyone knows, feel free to drop us a line. 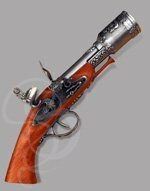 If you're looking for an addition to your pirate costume, you can't get much better than this flintlock.